The Connemara marble that is featured in this shamrock ring is the only natural green marble in the world; fittingly, Connemara marble is only found in Ireland. 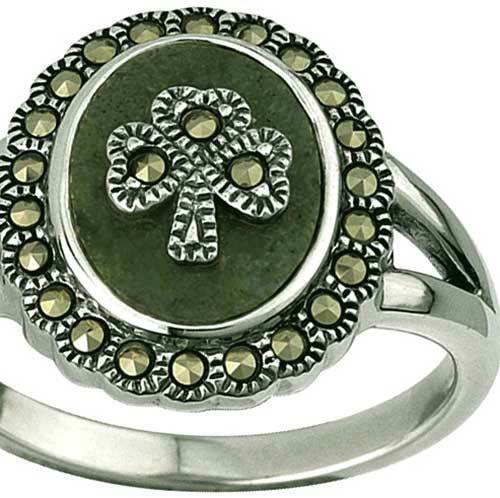 This sterling silver Irish ring features a marcasite studded shamrock that is superimposed on a disk of Connemara marble. The shamrock ring is further enhanced with a border of additional marcasite stones and the face measures 1/2" tall 5/8" tall. This Irish ring is gift boxed with shamrock and Connemara marble history cards, complements of The Irish Gift House. The Connemara marble shamrock ring is made by Solvar Jewelry in Dublin, Ireland. 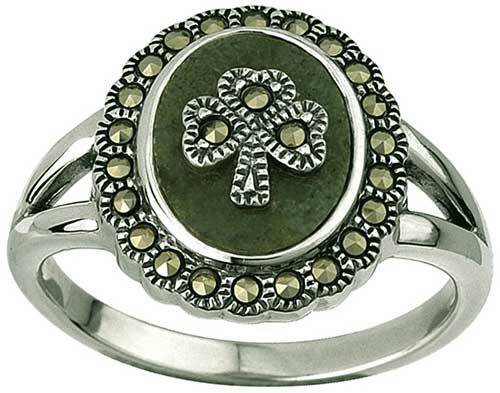 This women's shamrock ring is available in sizes 4 through 10, full sizes only.